The Morphy Richards steam cleaner has a good number of multi functional floor steamers ranging from the Morphy Richards 15 in 1 luna plus steam cleaner, the 12 in 1, 9 in 1 to the supersteam (detailed reviews below). The Morphy Richards offers a two year warranty for all their steam mops. The warranty will be provided as long as you have registered your product online after purchase. You are recommended to use distilled or de-ionized water to make your Morphy Richards steam mop last long. This will help your gadget not to clog. You are advised to make an online spare parts purchase from their online website. The interesting thing about making an online purchase is that after registering your product it will make it easy for the company to provide you with a spare part specifically for your cleaner. One can purchase replacement pads from Amazon, eBay etc; they sell a pack of 2 steam mops pads. These are of superior quality and facilitate the collection of dirt which has been melted by steam. However, It is recommended to acquire replacement cleaning pads from the manufacture because it then means they will come in the correct sizes depending on the model of your mop. The microfiber pads are designed to be absorbent. They come as a pair because on the pads is coarser in texture and heavy duty. You can clean this using the washing machine once you are done using it. For your scrubbing pad, you will need to remove dirt and stains. Therefore, you will have to glide the steam cleaner along the floor, pads designed to mob the floor are made of microfiber and some steam mops come with a scrubbing brush as an additional attachment. The Morphy Richards steam cleaner 12 in 1 , 720022 with illuminated and collapsible handle has an upholstery attachment to clean upholstery furniture and remove creases from your garments. Just like the 15 in 1 ; The 12 in 1 cleaner comes with a floor-head that has beaming light. The floor-head of the mop is illuminated. It beams out a powerful rays of light as you mop to enable you see any hidden stains or dirt and to also give you an idea on how well you are cleaning. It also has a handy detachable handheld device that can be customized with the wide array of accessories to clean 12 different parts of your house. It employs swivel steer technology that makes it quite easy to access hard to reach areas and tight areas like around table legs or under furniture fittings. The steam cleaner kills 99% of all germs and bacteria on your floor surfaces. The controls are conveniently placed right near the palm of your hand on the front of the mop which makes it easy to use. All the functions can easily be controlled by flipping buttons. It can perform up to 12 cleaning functions on your domestic spaces. It can mop floors, windows, upholstery, grouting, kitchen worktops and drawers,taps and sinks, toilet, bath and shower cubicle, tiles, blinds and even mattresses. You can basically use it to tidy up every part of your house to not only give you a gleaming finish but highly sanitized surfaces that are spectacularly tidy. It also has a carpet glider that you can use to refresh your carpets. The cord length is relatively short compared to other top of the range steam mops like the Vax Fresh Combi that has 8 meter power code. The Manufacturer recommends that you use iodised water for the durability of the gadget. With time the cost of iodised water could add up. However a good number of customer reviews indicate that many people use ordinary tap water on the cleaner without any problems at all. If you live in a hard water area, then it is recommended that you actually use iodised water for the long life of your mop. Without a doubt what you are getting here is a quality gadget that is unrivaled by many of its peers. 86% of the 60 customers who have reviewed the Morphy Richards 12 in 1 Steam Cleaner are quite happy with their purchase. The 12 in 1 cleaner has a high customer satisfaction rate and practical features like the foldable handle and illuminated floor head that make it a compelling choice for your domestic cleaning chores. It has continuous control setting to cater for all types of floors and anti scale feature protects your cleaner from clogging up. It is quite multifunctional and versatile: you can literally use it to tidy up anything in your house. It is lightweight, easy to set up and store. It has swivel steering that makes cleaning effortless. It has decent water tank that will give you 20 minutes of continuous heating and yeah, it heats up in record time. You can use it to mop any hard floors and to refresh carpets. This Morphy Richards 720022 kills 99% of all germs and bacteria to leave your floors shining. It has continuous cleaning without the hustles of pushing a button or holding down a button the entire time like is the case with some other mops. The Morphy Richards 9 in 1 steam cleaner is such that it can be used as a mop for your floors and also as a handheld cleaner. The handheld can clean worktops, bathroom cubicles, grout and many parts of the house. It comes with a carpet glider that enables it to refresh carpets. However there are mixed reviews on its ability as a carpet cleaner. Some say it is ok while others think otherwise. At least it gives you that added capability of using it for your carpets. All said and done, you cannot take away the versatility this gadget offers you. Once the 9 in 1 is on, you can choose how much jetting pressure to release using the trigger. This is a great feature that gives you control of your gadget. The Morphy Richards steam cleaner 9 in 1 is quite lightweight weighing 3 Kgs only. Has a 400 ml tank that heats up in 30 seconds by 1500watts motor to give you 15 minutes cleaning time. It is a standing device with a detachable hand held steamer that comes with a fully kitted piece of accessory to perform 9 tasks. In the standing mode, the 9 in 1 is suited to clean most sealed hard surfaces and can also used to refresh carpets. The handheld steamer is quite versatile; it can be used for cleaning work tops, ovens, kitchen hood, cooker and other kitchen appliances. It can also straighten your clothes and leave them streak free, freshen your upholstery and even do your car alloy wheels. The machine has a zero cool-down time, which is a great safety feature, so anyone standing near the machine won’t get harmed by any heat coming from the machine. Has a sizable cord (5m) for ease of use. It is versatile and easy to move about/store. Dries surfaces quickly and heats up quickly (well 30 seconds). It does not leave the floors wet. Cleans sofas, carpets, windows, bathrooms and worktops. Removes creases from your garments. It is easy to set-up. Kills germs without using detergents. Has a powerful jetting pressure and leaves floors streak free. Comes with machine washable cleaning clothes. Has a big head that cleans with few swipes and saves time. Comes with 2 years warranty for peace of mind. This Morphy Richards 9 in 1 upright and handheld steam cleaner uses iodized water which are sold in major shopping stores. The distilled water is relatively low priced to buy but if you add up the cost down the line, you may find that the cost may add up over the years. This is one aspect that is a niggling point so far. However, having said that iodized water keeps your gadget in tip top condition away from corrosion that may shorten its durability. You will need to use distilled iodised water for the tank, this can be a hassle to some people. The detachable handheld cleaner needs you to use two hands which can be limiting if you need your other hand to be free to get through the cleaning chore quicker. However this is not a problem if you are not the multi-tasking type; the detachable handheld cleaner is made this way for safety reasons. The problem with most cleaning equipment is the fact that most devices are cumbersome, heavy and difficult to move from place to place. The ease of use and the ability of the user to move the Morphy Richards 9 in one steam cleaner is one of the main attractions of having it. It has a sizeable 400ml capacity water tank, which enables the user to cover large cleaning spaces without the inconvenience of refilling the water ever so often. It literally cleans any surface, whether it is your tile or your carpet, or even wooden floors. It will also clean your windows, which is a great advantage right there. One thing as already noted above, Morphy Richards recommends using distilled iodised water. Some people say that they have used this Morphy Richards steam mop 9 in 1 on laminate flooring, cleaning moulding on walls, doing fixtures, bathroom fittings and windows. It is good value for money. Buy it with full confidence that it is worth it. The Morphy Richards 720507 Luna Plus Steam Cleaner is among the latest entry into the elite league of innovative idea of steam cleaning. It has all the tantalizing features that the Luna 12 in 1 has like ability to strap the handheld on your back to free your two hands to do any dusting or brushing. Currently unavailable on Amazon, you can check the 12 in 1 instead. The Morphy Richards steam cleaner 720507 luna plus runs on a 1600 watts motor that heats up the 430 ml water tank in 30 seconds to give between 17-20 minutes of continuous cleaning. It has a five meter power length and it only weights 3.1 Kgs. The 15 in 1 is fitted with a micro-pulse vibration setting on the floor head that dislodges deep seated dirt and grime by agitating them. It has the illuminated floor-head that makes your cleaning a breeze. A beam of light is shone on your cleaning path to give you an indication of how well you have cleaned. It has a water tank that is illuminated by some neon light to give you a hint on the level of water in the tank so that you can top-up if the water is running low. it has a carpet glider that will enable you to glide across your pile and refresh it. The manufacturer recommends use of iodised water to reduce chances of corrosion. The cost of using iodised water could add up over time. Make no mistake, the 720507 Morphy Richards 15 in 1 luna plus steam cleaner is a top quality cleaner by a reputable manufacturer. It is practical and functional due to its ability to perform multiple tasks effortlessly. Basing on the success of the luna 12 in 1 which at time of writing had a rating of 4.5 star our of 5 , a total of 86% customer satisfaction, you can not go wrong with this luna plus 15 in 1 steam cleaner. It has variable floor control setting with three main settings: high, medium and low. It is lightweight (weighs only 3.1 kgs). It kills 99% of all germs and bacteria on your surfaces. The Morphy Richards 13 in 1 Steam Cleaner is one of its kinds. It has an illuminated flooring head so that you can see the path of your cleaning especially in dark spaces like under furniture same as the Morphy Richards 12 in 1. The Morphy Richards 13 in 1 has an anti-scale cartridge that protects your steamer from damage, reduce clogging and prolong your gadget. It also has a fold-able handle for easy storage and the ability to spray your favorite detergent from the 720027. It is powered by a 1200 Watts motor that heats up the 300 ml tank in 30 seconds to give you between 10-15 continuous cleaning time. Has a floor head “tank” that has a spray where you can fill in a detergent of your choice. You can use the spray functionality in the floor head to spray your floors with your favorite cleaning agent to give them a nice scent. Has a large floor head which helps you to cover wider spaces in a short time. Comes with a wide array of accessories that you can use to clean up to 13 places in your house. It is made in a way that you can refill the “see-through” tank on the go without waiting for it to cool down. Has a variable floor control settings to allow you to select appropriate (recommended) floor setting for different floor surfaces. It also has a detachable hand held device that has added functionality to enable you can clean most parts of the house including hard to reach places. Can be used to clean: Sealed Hard floors, Laminate flooring, tiled floors, carpets and rugs, windows, Kitchens, bathrooms, work surfaces shower doors and Cubicles, upholstery and curtains. Comes with two years guarantee. The cord length is a bit short (5m long) . The manufacturer advises that you use distilled water which though cheap can add up in cost over time. Irrespective of the few shortcomings, the 720027 is a quality sturdy device]. Indeed to be honest the cord length of 5 m is decent enough to cover any standard room, you can live with it. As with most cleaners using the jetting vapour ensures quick and hygienic cleaning. The Morphy Richards 2 in 1 Steam Cleaner is one of the best 2 in 1 steam mops that can be used both as a mop and a handheld cleaner. Currently unavailable. Same as the Morphy Richards 9 in 1 Steam Mop; the Morphy Richards 70495 has a 400 ml litre tank that is powered by a 1500 watt motor which heats up in 30 seconds to give you 15 minutes cleaning time . It has different settings suitable for different floor surfaces from wooden floors to laminate flooring. Inside the package is also a handy bag for storage. It has functional 5 meter cord, enough to clean and manoeuvre one standard room. The manufacturer recommends distilled water. You can also use hot water; this will reduce the heating up time. The Water tank is easy to fill because it quickly detaches and so does the hand held cleaner which comes out at the push of a button. Has a wide range of tools and attachments to be used on walls, work tops, windows, grouting, crevices, upholstery and even refreshing garments. The Morphy Richards steam mop 70495 comes with a 2 year guarantee; to claim this you have to register it though at Morphy Richards. The Morphy Richards 70495 has a short electric cord (only 5 metres). Therefore, as you are cleaning around the house, you have to keep switching plugs. Only distilled water is supposed to be used to fill the tank for cleaning. There isn’t any heat proof pad for standing the unit on as it cools. Also, there isn’t a hanging hook attached to the mop, so when you’re not using the mop it has to be stood up on the floor but it comes with a handy storage bag where you can place it safely once it has cooled. 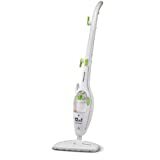 The Morphy Richards 70495 2-in-1 Verdict What is my verdict on the Morphy Richards 70495 2-in-1 steam mop? Overall for me, it scores more ticks than its draw backs. Some of its shortcomings though annoying for example the short electric code can be overcome by getting an extension code. Many of us already have extension codes anyway, so you can live with that. Basing on all its strengths and the affordable price it is currently going for, this is a product worth having. The Morphy Richards 2 in 1 Steam Cleaner is a high quality cleaner that ticks the boxes of durability, reliability and effectiveness. You can buy with confidence that you have two years guarantee as a fallback plan. However the thing is, you will hardly get any problems with this gadget. In case of any issues, reach out to the manufacturer’s customer service; they are quite friendly and patient. They will not keep you waiting but will attend to you. 74% of customers who bought the Morphy Richards 70495 give glowing accounts of its capabilities. This is without a doubt a quality product. The Morphy Richards multi floors steam cleaner is quite light weight, it weighs only 2.1 Kgs, can be moved out and about in the house.The multi-floor steam mop can be used on sealed hard floors, tiles, laminates, rugs and carpets. It has a quick access on/off button that will provide you steady steam without the need to keep pressing on the n button. This makes breaking between cleaning a breeze, all you need is to push the on or off button. It has a 270 ml water tank that can be filled at anytime without having to wait for this mop to cool down. It runs on a 1500 watt motor and has a powerful jetting pressure that blasts grime and dirt away. It produces steam continuously without the need to keep pressing a button which makes house cleaning fun and quick. It has easy to access control centre on the face of the mop head. It has an easily extendable handle to enable you navigate to those hidden places like tight places under furniture. Easy to fill and refill tank that can be filled while the gadget is still in use. It has a window at the back where you can view the water level. The Morphy Richards floor steam cleaner does not use detergent to clean but it is ultra hot that it kills at least 99.9% of all germs and bacteria on your floors. It does not have a variable floor setting nor anti-scale features. You are advised to use de-iodised mineral water to reduce clogging by lime scale. Especially if you live in places where there is hard water. Though the manufacturer does not recommend using tap water to fill the 720501 tank, most customer report using tap water without any problems. However using de-iodised water will make extend its lifespan. The Morphy Richards 720520 Supersteam Pro Steam Cleaner is one of the lightweight steamers that are effortless to manoeuvre around your home. It has a flexible and rotating handle for ultimate convenience. The Morphy Richards 720520 supersteam pro has a specially designed back saving handle included to help you clean those hard-to-reach places. It effortlessly cleans beneath heavy furniture thanks to its fold-able handle. It is more like the popular Vax Steam Fresh Combi but with more practical and functional features like the folding and flexible handle and ability to clean in 15 places in your house just as the Vax Fresh Combi. It has dual tank capability which total up to 600 ml water tank capacity. The upright floor mop has a 400ml water capacity while the handheld cleaner has 200 ml water tank capacity which makes it lighter than most cleaners in the market. The dual water tank gives you 30 minutes of continuous cleaning. It has lightweight handheld cleaner unlike other hand held devices by other manufacturers like the Vax Fresh Combi You would have thought that with such tank capacity the Morphy Richards supersteam would be heavy and cumbersome. Due to its twin tank, you can choose to detach the handheld when cleaning your floors, this makes it quite light. In actual sense, the combined weight of the mop and handheld cleaner is actually lightweight at just 3.6 Kgs and easy to man oeuvre as you work through all your rooms..
You can use it as a mop or a handheld cleaner. It comes with a variety of accessories to customize your cleaning to cater for all your domestic cleaning tasks. It can clean up to 15 different places in your domestic space. It has variable floor control that enables you to clean different floor types. It comes with a carpet glider that you can use to refresh your carpets. It has ergonomic and versatile handle. Never again will you complain of the cleaner being cumbersome and bulky. It features a cutting edge specially designed handle that makes accessing hard to reach places no problem at all. The handle folds at 90 degrees to effortlessly clean tight spaces and beneath furniture without the need to bend. The cable can easily be folded around the 7205220 handle for easy storage. You can use this Morphy Richards steam cleaner to clean a multitude of surfaces from hard floors, rugs carpets, windows and shower cubicles, laminate flooring, grouting, tiles, bathrooms to upholstery and even mattresses. The steam cleaner has an adjustable steam output. This means you can set the right steam especially for cleaning sensitive flooring that can be damaged if cleaned in super high temperatures. This supersteam has a number of practical features that will make your cleaning tasks easy and effortless. In my opinion it is better than the other best selling 15 in 1 steam cleaners. For peace of mind, this gadget comes with a two year guarantee. Vax Steam Mop Reviews – Which One is the Best? ©beststeammop.co.uk 2019. All rights reserved.